The Academy Group, however, also site certain characteristics for the probable offender which are not consistent with Tommy Skakel. Most notably: the Academy Group believe the offender was sexually inexperienced, a habitual window-peeper, and an emotional loner. To the best of our knowledge, these conditions are not consistent with Tommy's behavior at the time in question. 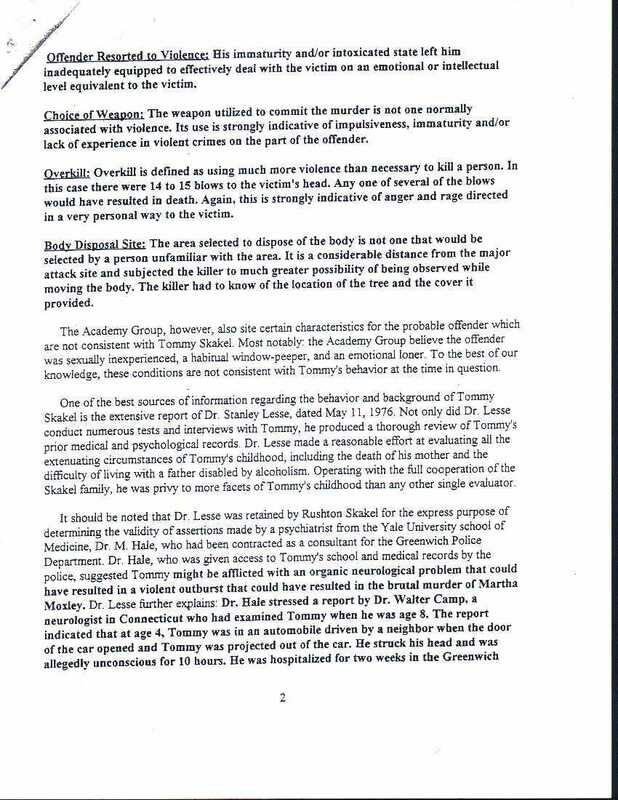 One of the best sources of information regarding the behavior and background of Tommy Skakel is the extensive report of Dr. Stanley Lesse, dated May 11, 1976. Not only did Dr. Lesse conduct numerous tests and interviews with Tommy, he produced a thorough review of Tommy's prior medical and psychological records. Dr. Lesse made a reasonable effort at evaluating all the extenuating circumstances of Tommy' s childhood, including the death of his mother and the difficulty of living with a father disabled by alcoholism. Operating with the full cooperation of the Skakel family, he was privy to more facets of Tommy's childhood than any other single evaluator.